Last week I attended the Kuyers Institute Conference on “Virtues, Vices, and Teaching.” The focus of the conference was on pedagogical practices that instill virtue in students. The big question addressed in the sessions was “how do we as educators build the character of our students (focusing more on who students become rather than what students learn) while still being faithful to the content of our discipline?” It was a great conference and I’m still processing many of the ideas. There was an entire session of papers that focused specifically on this issue in math education. Hopefully I will be able to cajole the authors of those papers to share their ideas here. For now, I would like to share one resource that was presented at the conference: the website www.whatiflearning.com. This site is for teachers who want their classrooms to be places with a Christian ethos or atmosphere, whatever the subject or age group they teach. It explores what teaching and learning might look like when rooted in Christian faith, hope, and love. It does this by offering over 100 concrete examples of creative classroom work and an approach that enables teachers to develop their own examples. “What if Learning” is a “distinctively Christian” approach developed by an international partnership of teachers from Australia, the UK, and the USA. It is based on the premise that a Christian understanding of life makes a difference in what happens in classrooms. Its aim is to equip teachers like you to develop their distinctively Christian teaching and learning strategies for their own classrooms. A shortcut link to these lessons will be included under the resource tab as well as the link side bar on the right. 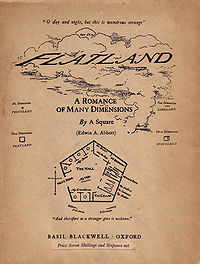 Last fall my advanced (freshmen) geometry classes completed a semester project on Flatland, a book by Edwin A. Abbott. In case you haven’t heard of this obscure yet significant work, let me start this post by providing a brief overview of the book and then I’ll describe the structure of the project. The essence of this project was to have students interact with the subject matter of this book through weekly reading comprehension quizzes, two in depth class discussions, and a culminating extension project done in response their understanding of the book. There were two major class discussions: one over the first half of the book that extended to a discussion of Flatland and society, and one over the second half of the book that extended to Flatland and theology. One week prior to our class discussion the students were given the following prompts and extra reading resources. Discussion 1: Flatland and Society: In addition to being an interesting piece of Geometric fiction, the first half of Flatland serves as a satirical social commentary on Victorian England. Do a little research on what society was like at during that period. Be prepared to discuss this social culture and link it by analogy to the society of Flatland. In your preparation I would like for you to wrestle with the following quote about mathematical advances in Victorian England (taken from Equations from God: Pure Mathematics and Victorian Faith, by Daniel Cohen) where we find “origins of the rebirth of abstract mathematics in the intellectual quest to rise above common existence and touch the mind of the deity” (emphasis added). Relate this comment to the notions presented in Flatland. Here are some questions that you might think of answering prior to class discussion, and these concepts may help you begin to organize your thoughts. It should be noted that none of these questions have easy answers, but they do have plausible ones. I am not looking for you to give a “right” answer, but to wrestle through the concept and tell me what you think. How does the society of Victorian England mirror that of Flatland? How are women depicted in Flatland? How were they treated in Victorian England? What point is the author trying to make in his depiction of women? Why might Flatlanders be interested in rising above common existence? Why would this be said of people in Victorian England? How does A. Square “touch the mind of deity?” How might we “touch the mind of deity” as we study mathematics? Book review of Equations from God: Pure Mathematics and Victorian Faith, by Daniel Cohen. Excerpt from: The Annotated Flatland: A Romance in Many Dimensions, Ian Stewart, Basic Books, 2008. Discussion 2: Flatland and Theology: Edwin A. Abbott was not only trained in mathematics but theology as well. The second half of the book can be seen as a theological analogy: the visitor from Spaceland interacts with Flatlanders in a way that might mirror how God, who is not bound by the limits of three dimensions, interacts with our three-dimensional world. Draw out this analogy using specific examples from the book and from the Bible to answer the question: “How do we experience God?” Be sure to cite any references you make to Flatland and use biblical examples of God’s interactions with His creation to support your ideas. How might our universe appear to a being outside of it? How did Flatland appear to the Sphere? What does it mean for God to be “over all, through all, and in all” (Ephesians 4:4-6)? How might this be said of the Sphere in relation to Flatland? How might it be possible for God to be omniscient (know what is happening in all parts of the world at the same time)? How can this be said of the Sphere in relation to Flatland or of the Square in relation to Lineland or Pointland? What were A. Square’s limitations in fully understanding the Sphere? What are our limitations in fully understanding God? What would we expect to see if/when God entered the world? How might it be similar or different from when the Sphere entered Flatland? Excerpt from: Mathematics Through the Eyes of Faith, James Bradley and Russell Howell (editors), Harper One, 2011, p.85. Choose from one of the following options as a project response to your reading of Flatland. The resources cited for each option are available on the course webpage under the “Projects” folder. You are not restricted to these resources, in fact you are encouraged to find additional ones, however the cited resources must be analyzed prior to beginning your project. The project proposal needs to include your name, class period, and the project option you have selected. You also need to provide a preliminary outline or plan of attack. The big idea here is that you need to demonstrate that you have spent time considering your project and have a clear plan for moving forward. All papers, while they may deal with a subject that is not explicitly mathematical, need to contain significant geometric content. Show me that you understand the geometry as it is presented in the book and then take that knowledge to analyze the subject matter of your paper. Papers will be graded more on mathematical understanding than on writing ability, though proper grammar and spelling need to be used (see rubric for more details). The book review should take 1 page to summarize the book and 1 page to critique it. In the critique you need to address what the author did well/poorly and why. You should also address what impact the book had on your understanding of Flatland. Be sure to comment on significant/interesting mathematical descriptions as they are presented. You will find several sample book reviews linked on the course website to give you a feel for what a book review looks and sounds like. Rewrite A. Square’s description of the visitor from Spaceland had that visitor been a Cube instead of a Sphere. Then rewrite the experience again if the visitor had been each of the other Platonic Solids (Tetrahedron, Octahedron, Dodecahedron, Icosahedron). This amounts to writing ¾ to 1 page on each solid. Write an additional chapter for the book in which the Sphere is visited by a person/object from the 4th dimension. Write the Sphere’s description of the visitor in a way that mirrors A. Square’s description of his encounter with the Sphere. Option 3: Explore 4 Dimensional Hypercubes: Complete questions 1-4 on the Hypercube Activity posted on the class website (Kuyers Institute Lesson on Hypercubes). This project will culminate with an activity in which you build a 3D model of a 4D hypercube. I must again apologize for the delay between posts. I have spent the last few weeks settling in to my new teaching position at Regents School of Austin. I plan on sharing more about Regents later. 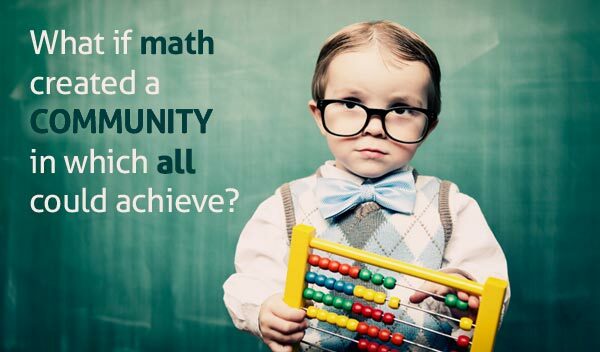 Throughout my orientation to the school I have been practically overwhelmed by amazingly well stated arguments for understanding mathematics from a Christian perspective and outstanding faculty who live it out in the classroom. I have been doing a lot of mental processing and I hope to share the fruit of that labor soon. For now, I wanted to share my first day of school lesson for my advanced geometry class. For the first time in my professional career I am in a position to openly teach on the integration of faith and mathematics. I plan on taking full advantage of the opportunity. I’ll share as much as I can here, in hopes that it may be helpful to other teachers, and in hopes that these lessons might get refined through comments and discussions in community. This phrase is said to have been inscribed on the door of Plato’s academy. It roughly translates to “Let no one ignorant of Geometry enter here.” This translation necessitates clarification for students. 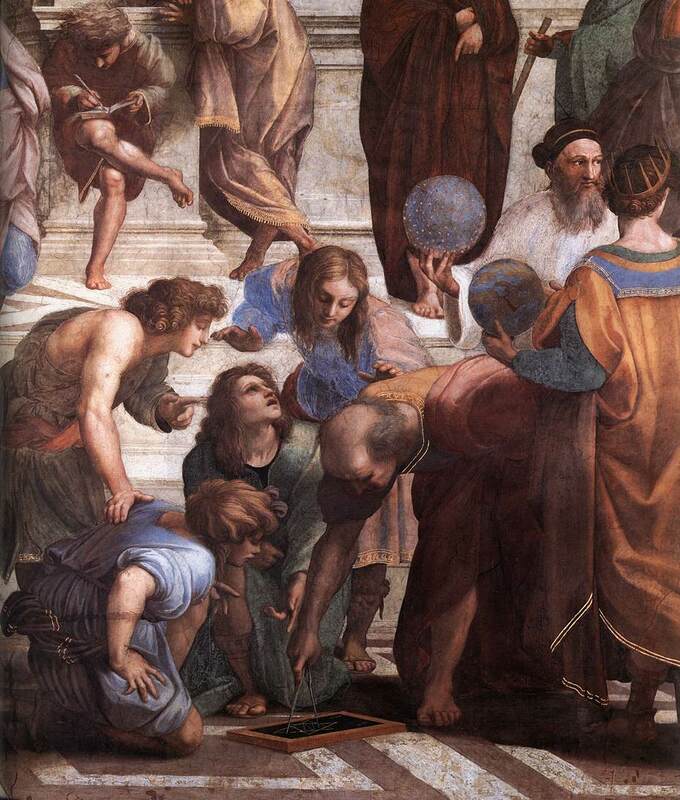 Plato was not standing at the door checking transcripts to see who had their Geometry credit. Plato is not interested in his pupils’ ability to do mathematics, rather he is interested in his pupils’ ability to think. In this context, Geometry is a way of thinking; a way of thinking that is logical and consistent, and to be ignorant of it is to be unwilling to accept the value of reasoned study. With this idea in mind we can broaden our definition of Geometry from “measuring nature” to “thinking logically and consistently about nature” or perhaps more succinctly “thinking rightly about nature,” though this last phrasing is likely to gain little acceptance in a postmodern world where truth (rightness) is relative. Oh well. Truth is objective. I am not going to argue for this point here, but it is crucial to accept if we are going to continue to define geometry Christianly. The next logical question is, if Geometry is “thinking rightly about nature,” how do we define “rightly”? As Christians, our definition of truth/rightness comes from the nature and revelation of God. God is Truth and He has given us His Word to reveal Himself (truth) to us. His Word appears in a variety of ways and in general we can classify God’s revelation into two broad categories: special revelation and general revelation. Special revelation is detailed and specific revelation of the nature of God, the nature of creation, and how the creation is to relate to the Creator. This is the Word of God as revealed in the written Word of Scripture and the incarnate Word of Jesus Christ. This revelation is primary. This revelation is salvific. General revelation is how God has revealed Himself through His creation. Looking at the intricate designs and beauty of nature gives us a sense that there must be a Designer, a Creator, behind them. Creation is the Word of God that was spoken in Genesis 1 that brought forth order from chaos. This ordered realm in which we live is where we find Geometry, only now we can refine the definition from “thinking rightly about nature” to a more Christian perspective of “thinking rightly about creation” – and by “rightly” we mean with an understanding that special revelation exists and is the primary source of revelation for ordering our lives and our relationship to God. To do Geometry Christianly is to order our lives in a right relationship with God, through His Son Jesus Christ and His Holy Word, so that we might be able to think clearly, consistently, and truly about His created order. The verse that ties this all together is the verse that is used as the theme for this website: Colossians 1:15-17. He (Christ) is the image of the invisible God, the firstbornover all creation, for all things in heaven and on earth were created by him – all things, whether visible or invisible, whether thrones or dominions,whether principalities or powers – all things were created through him and for him. He himself is before all things and all things are held togetherin him.